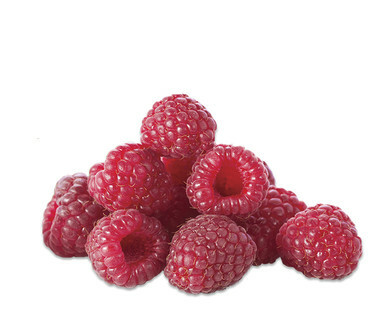 Raspberries are an excellent source of dietary fiber, which increases the transit time of the intestines. Faster intestinal transit time may prevent the development of certain cancers. Raspberries are also excellent sources of vitamin C. Vitamin C is a powerful antioxidant that helps boosts the immune system. Raspberries, like other fruits and vegetables, may help prevent obesity, heart disease and cancer when consumed on a regular basis. Raspberries contain more than 85 percent water. You can feel full without piling on the calories. Avoid added sugar and calories by naturally sweetening your dishes with raspberries. Make sure raspberries are dry, plump and firm.